Premium members get access to our PDF maps and cue sheets for any route that has cues. These are great for navigation if you don’t have a GPS unit or smartphone, or to pass out to riders participating in an Event or Club ride. Learn more about How to Turn a Ride into a Route with a Cue Sheet. Select your route that you want created as a PDF. 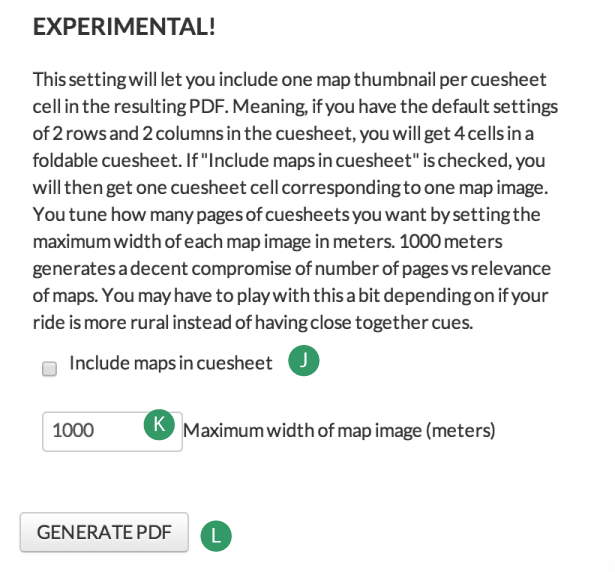 This will take you to the print options page where you can customize the look of your map and cue sheet PDF. Select from US Letter, Legal, A4, and A3. Choose from Feet/Miles or Meters/Kilometers. Yes/No. Including the map is optional if you only want a cue sheet for the turns. Yes/No. Including the cue sheet is optional if you only want to include the map. By default, it is filled in with the route name, but you can change it here for the PDF creation. It will not affect the actual original route name. Additional text of your choice that will appear at the very bottom of the PDF. Great for contact info. Landscape or Portrait. Change this option to match the overall orientation of your map. Yes/No. The POIs will be listed in the order in which they are created while planning your route. If you don’t have any POIs, then nothing will be added to the PDF. Click (REARRANGE) to change the order of the POIs in the list. Useful info to help a rider visualize which hill they are on over the course of the ride. Sometimes the elevation profile can flatten out hills or make small hills look large. 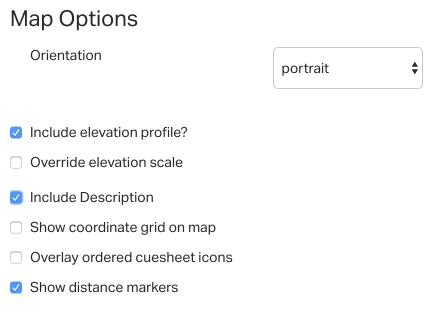 Changing the minimum and max allows you the ability to customize the elevation to your liking. 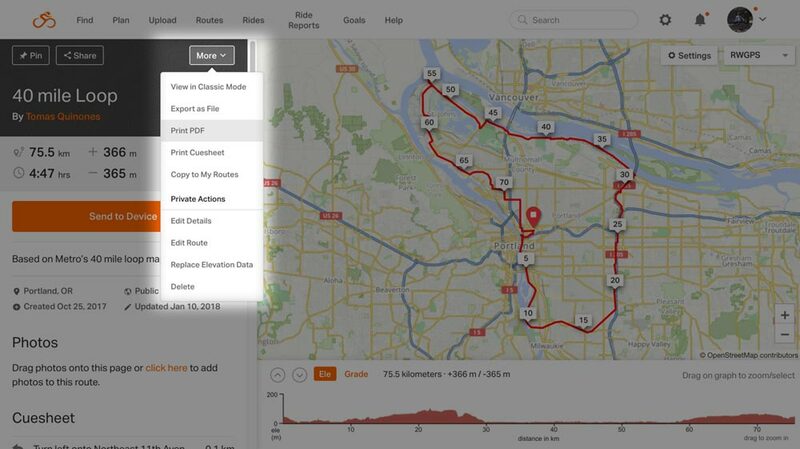 If you added a description of the route when you saved it, that text will be included. Show coordinate grid on map. Latitude and Longitude grid lines will be included to assist in navigation. Overlay ordered cue sheet icons. Each line in the cue sheet is giving a number to correspond with the cue on the map. Shows the mile/kilometer markers along the route. When including POIs in the PDF, you can change the order on the PDF by clicking the REARRANGE link then drag the POIs then drag and drop into the desired order. Now let’s go through the options to customize the look of your cue sheet. Portrait or Landscape. Choose the orientation that best works with the route. Defaults to 2 x 2. This is so you can fold the printed cue sheet into fourths and fit it into a sandwich baggy. You can also change it to 1 column, 2 rows or 2 columns, 1 row. Defaults to 10, but can range from 10 to 16 points. Each turn is giving a sequential number automatically and can be matched to the printed map. Total distance from the start to this cue. How many miles/km from the last cue. How many miles/km to the next turn. 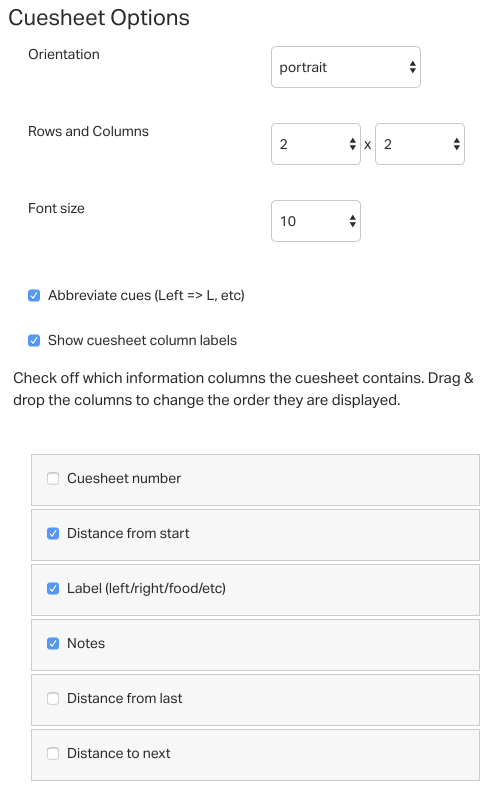 Click and drag the cue sheet column names to change the order they appear on the cue sheet PDF. Click GENERATE PDF to have the PDF created and read for download. Depending on your web browser’s configuration, it may either open directly in your web browser, downloaded into your default DOWNLOADS folder, or prompt you for a download location. Open the PDF with Adobe Acrobat, Apple Preview, or one of many other available PDF readers. 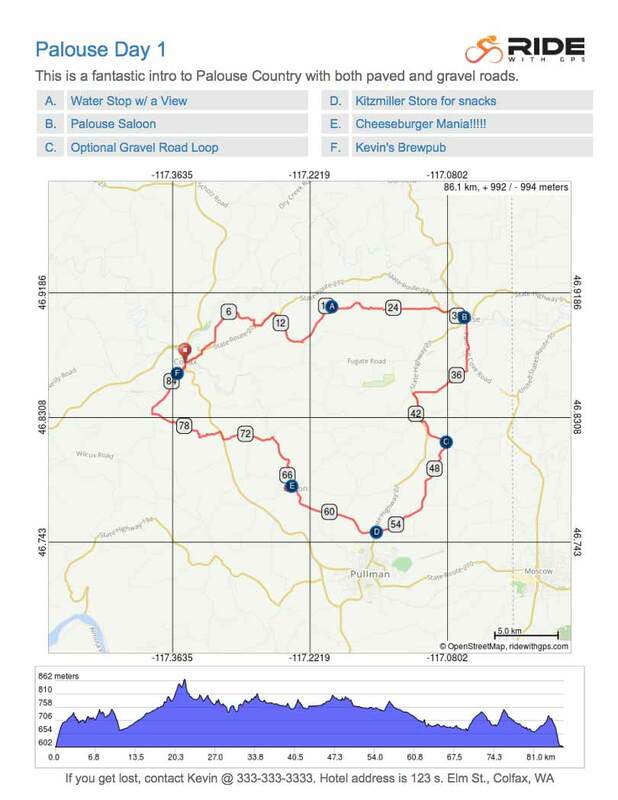 Download a sample PDF map and cue sheet for this ride. Read the description in the box to the right to learn about Experimental Maps. This option will produce many more pages to the PDF, so it is generally not desirable unless you are in very unfamiliar territory. K – Maximum width of map image (meters). Defaults to 1000 meters square, but you can adjust this number to zoom in our out of the map in the cue sheet. L – Generate PDF. After this button is pressed, the system may take up to a minute to generate the PDF then it will automatically e-mail it to the address at the top. 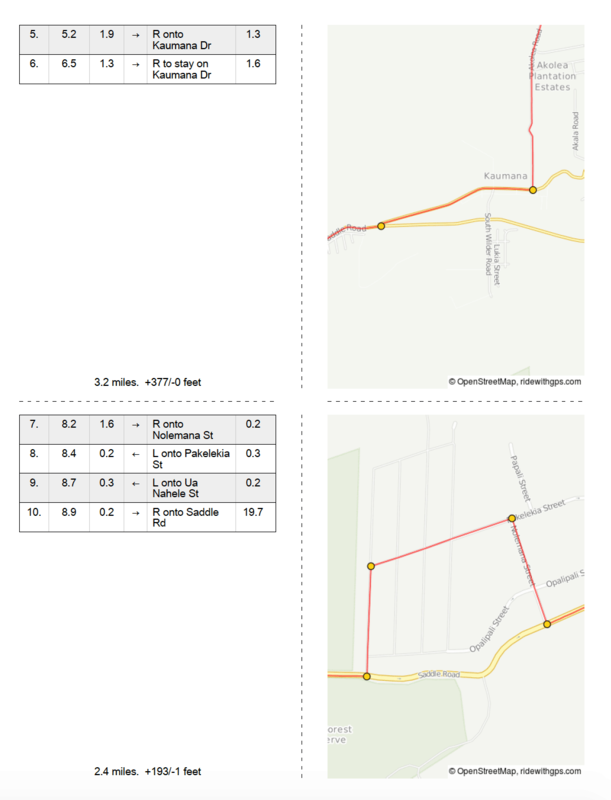 If you checked the box INCLUDE MAPS IN CUE SHEET, here’s what one of the pages will look like. Download this sample PDF to view a fully customized map and cue sheet with this option selected. 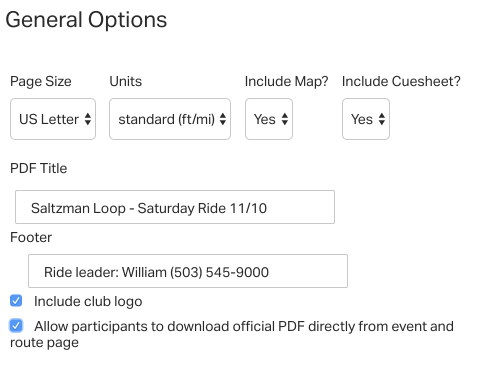 Club accounts have the option to include the club logo when creating PDF maps and cue sheets to send out to your ridership. These steps will replace the Ride with GPS logo with your club logo in the upper right corner of the PDF Map. Your club must first have the logo included in the club account settings before this option will work. Go to your club page. Go down to the route library and select the route to be made into a PDF. 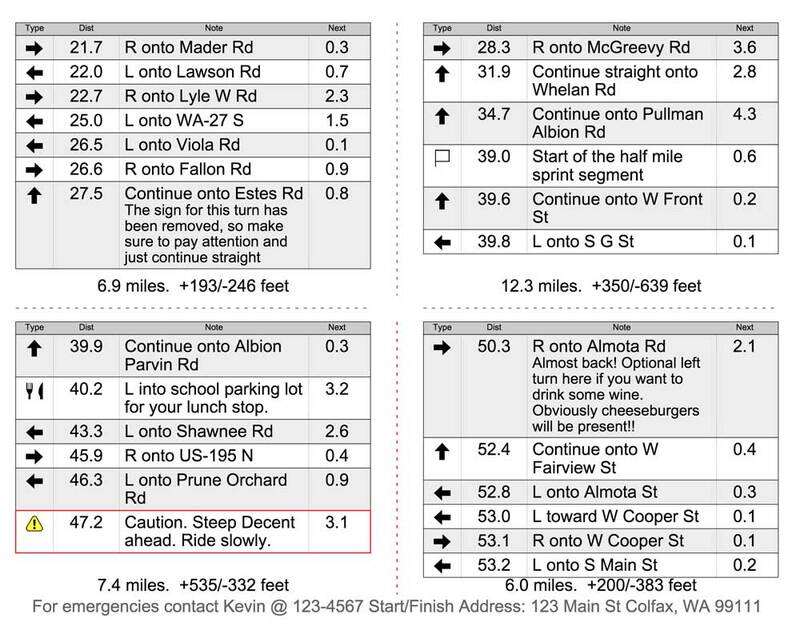 In the right side panel, click PRINT PDF MAP & CUE SHEET. Put a check next to the option INCLUDE CLUB OPTION. Scroll to the bottom of the page and click GENERATE PDF to have the file emailed to you. Make sure to check the email address first! 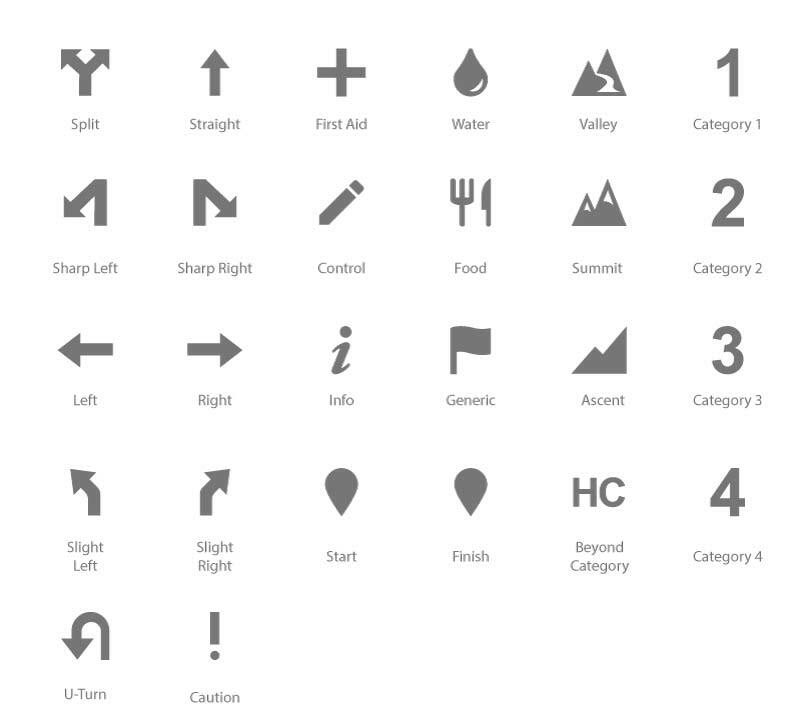 Here’s a simple legend on the icons that will print on your cuesheets. Pan and zoom the map to show more detail. We will use your viewport when we generate the PDF, as long as your viewport is more zoomed in than the route itself. Unhappy with the way the PDF turned out? Revise your map, go through the steps again, change the options, then click GENERATE PDF to download it.